Caption slip reads: "Photographer: Lou Mack. Date: 1957-10-06. Assignment: Best dog in show Brookside Pk. 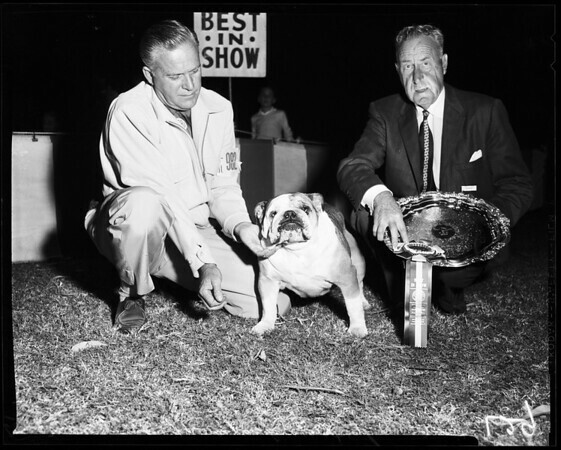 30/31: Handler Porter Washington, with English Bulldog, England American cahmpion Banshee of Beechlyn, owned by John O'Nelveny, of L.A. and Judge and President of show, Dr. Frank Porter Miller. 7/8: Handler Porter Washington, and Best dog in show, Eng. bulldog Champion Banshee of Beechlyn".